Size: 1/4 " 1/2 " 1 " 1.1/2" 2"
Air Service Unit , Filtration & Regulation of the Compressed Air , Increases equipment life & efficiency , FL. 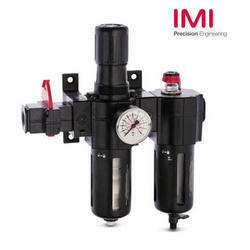 Our organization is involved in offering an extensive range of Filter Regulators Lubricators. These are available in different sizes, bowl capacity and models. Our entire range is offered in compliance with the international quality standards. Filter Size: 1/4", 3/8", 1/2", 1"
Regulator Size: 1/4", 3/8", 1/2", 1"
Filter+Regulator+Lubricator size: 1/4", 3/8", 1/2", 1"
Our firm is accomplished to present Air Filter Regulator Lubricator. Our products are extremely used by patrons owing to their longer life. 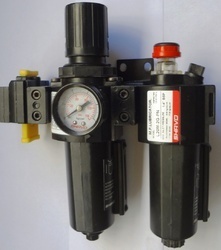 Our clients can avail from us a wide range of Filter Regulator Lubricator, which are procured from reputed vendors. These lubricators provide air line lubrication to different types of air driven tools. Moreover, we also offer filters and regulators to the clients in different specifications. - Service units for preparing compressed air, consisting of different combinations of units in two series. We are offering FRL with Gauge to our clients.